For years, and still today, many people believe that the language barrier will prevent successful outsourcing. Although it is possible for language differences to pose an issue, the real problem normally lies in a failure to communicate. Even when the client and the outsourcer speak the same language — such as when an outsourcer in the United States is dealing with a client in Australia — differences in accents, vocabulary and syntax can make communications difficult. These issues can be magnified when the client and provider have different native languages. 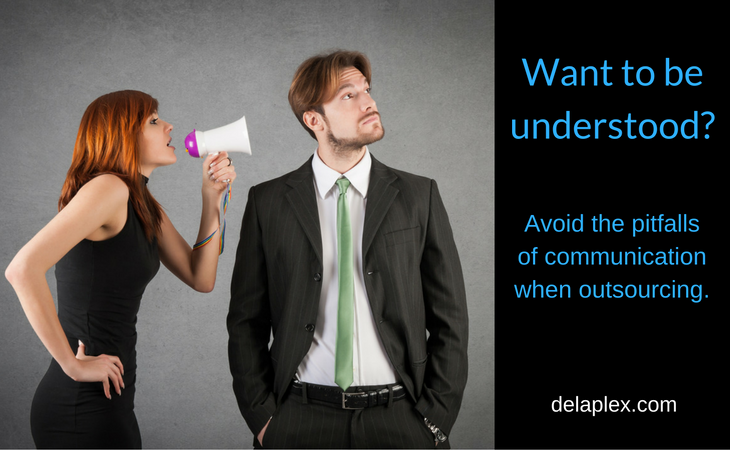 Here are some tips on how to deal with language-based communication issues when outsourcing. If your project is to succeed, you need an outsourcer with the right skills as well as fluency in English. India has become one of the most popular countries for outsourcing due to the large pool of talented and expert technicians. However, what many people do not realize is that India has a higher percentage of English speaking workforce than many other nations, including Russia. Additionally, India has a large number of people where English is their first language. Language, especially the spoken word, can rely on more than just the textbook meaning of a term. There are many nuances that can interfere with communication, so you will need to have a basic understanding of any cultural differences. For example, when presented with a specification, an American developer might bluntly inform you that it cannot be handled as you want. A developer in another country might couch his objection in gentler terms, perhaps asking whether you have considered the consequences of what you are asking or countering with, "I respectfully suggest that X be done instead." It is all too easy for an important word to be misheard or misinterpreted during a telephone call. With an email, however, every word is available for both the sender and the recipient to review. Written communications also help you to focus on what you need to convey, which helps ensure that you are stating matters clearly and unambiguously. Redundant oral and written communication methods are good. Always remember to follow-up a telephone call with an email or an email with a call outlining your conversation to avoid any miscommunication. Ideally, every team member working on your project should be fluent in English. At the minimum, however, your main contact person must be able to understand English in both the written and spoken form. Your contact person is often the project manager or supervisor, so you want to make sure that he or she is fluent in English. Having an onshore, native English speaking project manager or coordinator can greatly improve productivity. In America, virtually everyone would understand your instructions to make sure that lost packets are "scarce as hen's teeth." For someone for whom English is a second language, however, the literal translation may be confusing. Choose words that are not ambiguous or misleading. At the very outset, create a plan for how and when communications are to occur. For example, on status updates, decide whether you want weekly teleconferences, daily emails, or weekly phone meetings with the project manager. Without a plan, it can be easy to become complacent, and without regular updates, you cannot be certain that your project is proceeding on schedule and/or moving in the right direction. At delaPlex Software, we make it easy and affordable for you to outsource your software development and testing. We are headquartered in Atlanta, Georgia, with multiple development facilities in India. All of our team members speak English fluently, and you can have easy access to your dedicated team members by email, Skype, or by calling a U.S. phone number. In addition, our project managers are U.S. based. To learn more about how we work and help you solve problems, contact us today.